In this domesteading experience, power and dome delivery have been our most significant accomplishments so far. We started working with the power company (to price going on grid before making an offer) at the same time we made first contact with our dome vendor: late last fall. It took until summer to finish planning the dome layout with the vendor, another 8-ish weeks for kit manufacture, and the dome was delivered at the beginning of autumn. Without further ado, here’s the domecoming story. On the surface, having building materials delivered on a truck seems like no big. It sounded like we needed a couple friends to come help out for a morning. But when you break down what it means to unload an entire house shell from a full-sized semi trailer, the planning gets real. • Truck access: The dome kit comes on a full-sized semi truck, period. We were so worried it wouldn’t be able make the sharp turn up our driveway that we spent a lot of time on the phone petitioning the vendor to ship it on 2 smaller trucks or a single-axle truck (with a snub-nosed cab). No dice. So, we spent hours preparing the driveway, removing branches that could scratch a semi cab – thank you to our GC for helping us understand the truck driver’s perspective – and taking out a few last trees to make the entry turn possible for a full-sized semi cab. Because of an even sharper turn near the top of the driveway, the semi would only be able to park within a hundred yards of our property line. We cleared an unloading spot as best we could and began to plot the fastest way to unload the panels to the storage area. Just in case the truck wouldn’t fit up the driveway on the day of arrival, Chris spoke with the owner of a convenience store 2.5 miles away to see if we could park/unload a semi in their side lot (and trailer the dome pieces to the property). It would’ve cost so much more in labor and gas, but failure to unload the dome wasn’t an option, so at least we had a plan B. We didn’t end up needing plan B but have a ton of gratitude for that convenience store for their offer of help. Customers for life. • Unloading equipment: As we paged through the copious, dilute unloading documentation from the dome vendor, it began to dawn that we were on the hook for rental of a serious piece of equipment: a lull (a 4×4 forklift) with at least a 14′ reach. Standard rental period for a lull is 1 week at about $1,700. They don’t rent them just anywhere, and some places won’t rent to non-contractors. They don’t want to be responsible for damage inflicted by novice drivers. We’d hoped to be able to practice for a few days and run it ourselves. However, if you’ve not been around this kind of machinery (I hadn’t before this), it’s insanely mighty. And loud, so you have to know hand signals because the driver can’t see exactly where the forks are going, and you can’t hear each other yell. A fork can take off an arm off in a heartbeat. Stacks of dome pieces weigh hundreds of pounds but are surprisingly fragile…This wasn’t a job for a couple yahoos who practiced on a rented machine for a few days before the delivery arrived. For us, a professional crew was a necessity. • Unloading team: After the revelation about hiring professionals to drive the lull, rather than rent from a rental place for a whole week, we changed direction and rented a lull for 1 day by way of hiring the crew who owned it. Our dome vendor had assured us (repeatedly, verbally and in writing), that we only needed 3 people on the day of delivery, 4 tops, including Chris and me. We ended up not only hiring 2 guys and their lull (who happen to be our GC and his son, also our talented barn builder); we also hired one of our awesome excavators and his Bobcat and trailer to speed the unloading of components at the storage area. With a team of 5 and a lot of heavy machinery, we were ready for a fast unloading…we thought. • Time constraints: Our dome vendor pays to have the semi onsite for 3 hours. You pay for time overages at $75-$100/hour. The vendor said (repeatedly, verbally and in writing) unloading would take 3-4 hours with 3-4 people and a lull. Spoiler: it took 7 hours with 6 people, a lull, a trailer, a Bobcat, and a pickup truck. Truck drivers make a living on the amount of loads they can deliver between mandated rest hours. In order not to waste their valuable time and your valuable money, everything about the delivery needs to be planned beforehand, like how and where the kit will be stored. Storage should be as close to the truck as possible because of the time it takes to move these fragile kit pieces around. You also need a big stack of 4x4s or pallets staged and ready to act as racks to keep the panels off the ground. And special fork extenders for the lull; our crew of Renaissance men custom-welded spacers for the occasion, but they can also be made of 2x4s and plywood. As we worked hard to coordinate for the big day, we faced another time issue: the dome vendor said they wouldn’t guarantee a delivery date. Unacceptable. If you’re sending a massive delivery to a family who’s on the hook to hire the lull and staff up an unloading crew, saying “The truck may be there on X date” is not okay. It was fine when they pushed the date back 2 weeks due to a hurricane, not only for safety but because they gave over a week’s notice. But when the arrival date started shifting within 36 hours of arrival? Not okay. Fortunately, the dome company’s logistics staff was more realistic than the dome company’s policies. She not only made herself available nights/weekends and during a hurricane, she gave us an arrival date to hang our hats on. When the trucking company said they’d deliver it the evening before instead, she fought for us and won. I’m not fully detailing the nightmare-level stress we were going through during each stage of this process, but imagine a string of cranky calls and messages from a shipping agent you’ve never heard of before (to both of our cell phones. While we were at work), 36 hours before you’ve taken a day off work and hired $2,000 worth of people and equipment…saying they’ll be there in 24 hours instead. Again, the dome vendor’s logistics person was able to help us get back on track, but we should never have been subjected to that level of uncertainty or abuse from the shipping agent. The trucking company agreed to hold delivery until Friday morning as planned, but Trucker Tony arrived in town with the dome about an hour before sunset the night before. The dome vendor had armed us with Tony’s cell number, so Chris called to let him know where he could park overnight, in the lot of a closed-down Chinese buffet at the edge of town. Chris met Tony there and drove him to Freestone before dark to make sure he was good with the narrow road and sharp driveway turn. He was. Trucker Tony has driven much harder routes in his career. He was fascinating to talk to. Though our driveway probably wouldn’t have been accessible by dual-axle cab without all the work we did to prepare. That was validating. The mountain approach was no problem for Tony, but he did accept an offer to “walk him in,” driving our cars in advance of his truck to warn people of an approaching semi, since it was taking up most of the road. With the crew assembling at Freestone, Chris and I met Tony at 7:30 at the Chinese buffet. We looked over the truck together before Tony got in and started her up. The clock was ticking from that point. The shipping company monitors how long the truck is running for each load. Ten minutes later and after meeting a handful of soon-to-be neighbors to ask them to pull over for a moment, Tony was maneuvering the tractor-trailer up the driveway. The lull was started, and we kicked into gear precisely at 8 (the original arrival time we’d been promised). We worked through 3 p.m.
As the lull crew unloaded huge stacks of dome pieces from the trailer, Chris and I moved smaller pieces with Black Sunshine, did inventory, and arranged the 60ish 4x4s we’d purchased into racks to keep the dome pieces off the ground. Tony had rules to follow around how much he could help, but he quickly became team member #6 as he unstrapped the load, consulted on the difficult items to remove from the truck, and helped make sure that we completed the inventory as much as possible. We didn’t stop to eat. The lull was never turned off. Without every single person there, it wouldn’t have come off. I’d made a big thermos of coffee for what turns out to be a non-coffee-drinking crowd so ended up with a lot of caffeine to myself. That made my day easier, though no amount of hot, brown nectar could alleviate the stress of crimping Tony’s style. Our allotted 3 hours passed in a flash, with more than half the dome still on the semi. Some of the components had been loaded by the dome vendor in an way that either broke them in transit (1 was snapped completely in half) or made them nearly impossible to unload without damaging the dome and Tony’s pristine trailer deck. With time ticking and Tony at risk of losing his next load, our crew had to take a deep breath and strategize. In the end, it took over 2 hours to remove the 2 most poorly loaded stacks, and Tony missed his next job, but the deck was not scratched, and the dome panels weren’t pulverized. Tony was exceptionally gracious – and interesting to talk to, especially about driving trucks. I have a new understanding of the profession. Not cool, dome vendor. Not cool. The entire job kept Tony onsite 7 hours. The dome vendor took zero responsibility, only apologizing that we’d “had a bad experience” (sigh). Watching Tony back the truck down the driveway in the rearview, with the dome delivery behind us. The dome is home. We’re stoked to have the kit onsite, less stoked about what it took to get it here. If you’re considering dome-kit vendors and would like to talk through pros, cons, and tips for working with ours, please feel free to contact us and take advantage of our 20/20 hindsight. We believe this will be a beautiful home but have certainly gained a greater understanding of what it means to work with a kit vendor in general and ours specifically. We’d hoped to assemble the dome shell before winter, but timing was too tight, cold weather too early. Concrete won’t set if it freezes at night. Now, we protect the panels from winter weather until it warms up enough to build. This gives us time to hunker down and plan the foundation and basement walls, which must be meticulously thought out before they’re poured. While we’re impatient for spring, warm weather, and the dome to be built so we can put our stuff in it and live there, we know extra time is a gift. Every week, new ideas pop into our heads, and our plans evolve to make the dome even more dimensional. 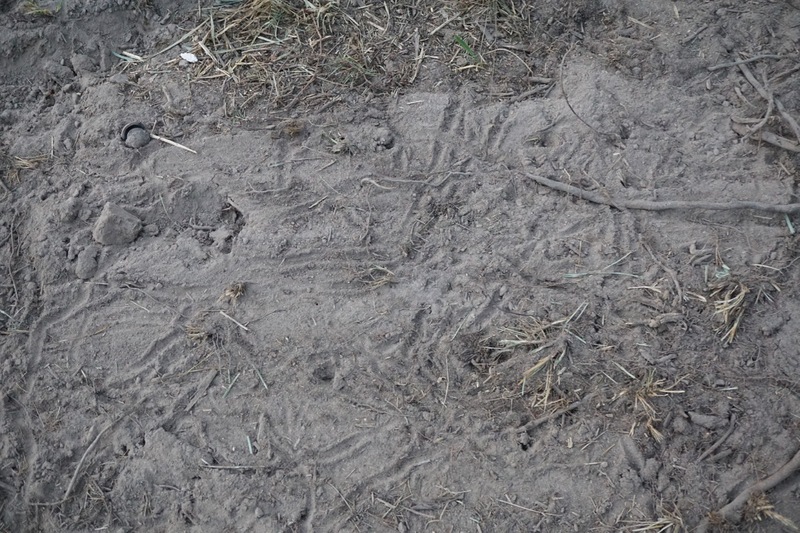 Until next time, here’s a picture of turkey tracks around the dome components. They and our human neighbors have been keeping an eye on the tarp village. They’re all waiting for it to turn into a dome, too.